If you love nature, recreation and tourism, interested in the processes that occur in the environment, the Carpathian Biosphere Reserve (CBR) is for you. As the main tourist sights of it act unique natural features, breathtaking landscapes and the unique atmosphere of the land. CBR was established in 1968 and since 1992 is part of the Network of Biosphere Reserves by UNESCO. The subject of activity is the protection of natural systems, organization and research and monitoring, environmental education of population and development of ecotourism. It covers all climatic zones of the Carpathians - from the plains to the alpine zone at an altitude of 180-2061 meters above sea level and adequately represents the landscape and bio-diversity of Ukrainian Carpathians. At the CBR are pristine forest and alpine meadow ecosystem. Within the reserve is Hoverla mountain (where convergent boundaries of Reserve and Carpathian National Park) and other highest peaks of the Ukrainian Carpathians (Petros, Brebeneskul, Ribs, Gutin-Tomnatyk, Pop Ivan Marmarosky, Blyznytsi, etc. ), the geographical center of Europe, the largest in Europe areas of beech and beech-spruce-fir primeval forests, Narcissus Valley, the largest karst caves of Ukrainian Carpathians. There are growing Edelweiss and “Red Ruta”, large populations of Carpathian brown bears, lynx, forest cat, golden eagle and many other rare and endangered species are protected. Stone arch - grand natural wonder in the stow Chur of Uholsko-Shyrokoluzhanskyi panels near the village of Mala Uholka. At one time it made a great impression on the Ambassador of the Russian Tsar Ivan the Terrible, who visited these places in 1552, returning from Constantinople to Moscow. This is truly a unique place. It is difficult to reach, access road is very bad, and within a year the trail comes only a few thousand tourists. 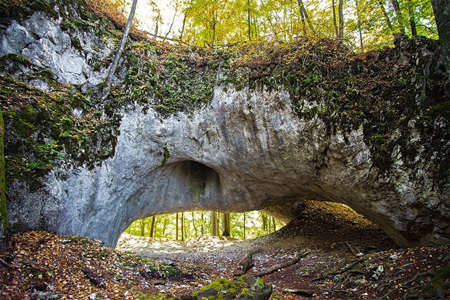 The karst bridge itself that is the end of the route, according to scientists, was formed at a time when the Carpathian Mountains were the seabed. Karst cave, located in Tyachiv district of Transcarpathian region, north of the village of Great Uholka within Uholsko-Shyrokoluzhanskyi reserve area. Here was found late-paleolitic parking primitive man, which is of great scientific value. 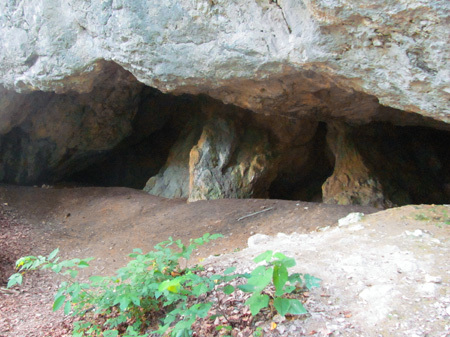 In prehistoric times, the cave was inhabited by cave bears, and today it serves as home to bats and blind residents of specific dungeons - troglobionts. Here are well presented good sinter formations formed calcite that resemble organ pipes. To view the cave be sure to take a flashlight, without it you will not see streams of limestone, which gave the name of the cave. The cave has a secret passage, which is not so easy to find: it leads to the second floor and ends another room. The total length of the cave is 92 meters. At the time of the Habsburg dynasty it was hunting grounds of Prince Eugene of Savoy (1663-1736), Austrian feudal and winner of the Turks. Only he and his guests were allowed to hunt here. The stow is covered by secular virgin forests, which are dominated by oak and beech forests, steep rocky ridge cut Jurassic limestones. Here on some rocky outcrops are preserved branches of common yew - relict plant that came to us from ancient periods. 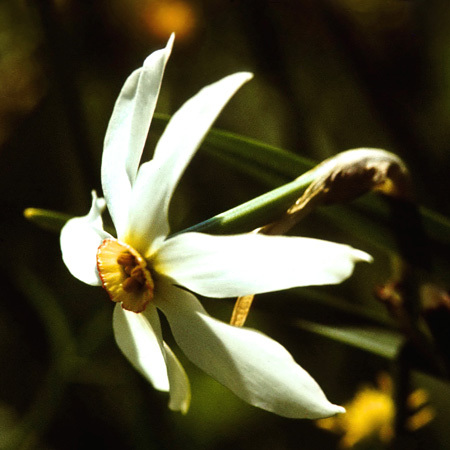 Highlight of CBR, botanical uniqueness of which is that on a small area in the stow Kireshi, 4 km from the city Hust of Zakarpattia Region took refuge almost 10 percent of the entire flora of Ukraine, or 25 percent of Transcarpathia flora, including rare and included in the Red Book of Ukraine species. 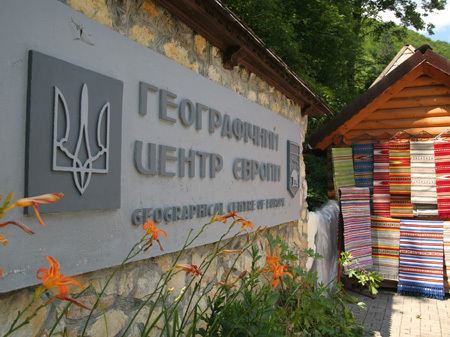 In the village Dilove of Rakhivsky District near the border with Romania is set geodesic sign “geographical center of Europe”. Sign has the form of truncated tetrahedral pyramid. At the sign is also stele, parallel lines of which represent the four cardinal points. Determining the latitude and longitude of the point that has been the center of Europe, have been made by Austrian scientists a little over a century ago. 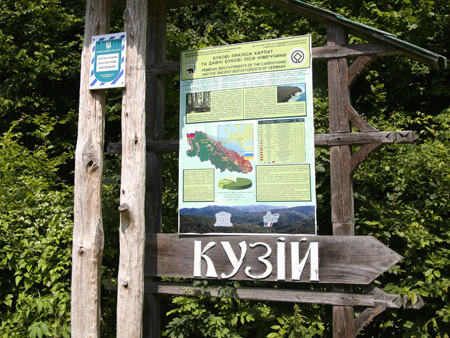 Nearby are resorts for tourists who can visit kolyba museum, souvenir market and source of mountain water. Trout farm of CBR is in a stow Lischynka of Trybushansk environmental research department. At the territory there are 9 pools available for feeding fish and incubator equipped with 32 Schuster devices. In the fish pool are held more than 65 thousand Salmon species with fry: brook trout, rainbow trout and char American. Brook trout is bred exclusively for release in many mountain rivers and streams to support not numerous natural populations, while the introduced species are for commercial purposes. In trout farm you can not only buy fish, but catch it yourself. Along is located tourist information center, the exhibition of which is devoted to aquatic ecosystems and their inhabitants, the Carpathian trout. Mountain Terentyn - southern spurs of Svydovets ridge of height of 1388 m asl over town of Rakhiv. 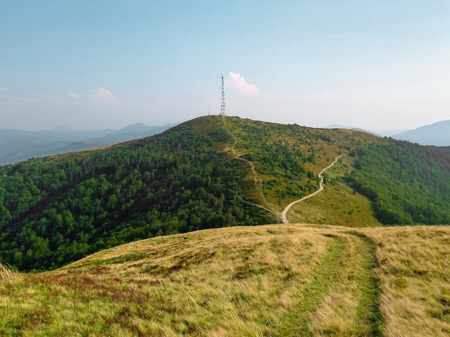 Namely Terentyn mountain is a natural geomorphological boundary between flysch and crystalline Carpathians, the latter of which are quite rare in Ukraine and are known as Hutsul Alps. At the top of the mountain is the Austro-Hungarian military road in the frame of a typical Hutsul area, which offers beautiful views of the surrounding mountains. At the top of Terentyn there is a large translational complex, monumental tower of which is visible for tens of kilometers. It opened unforgettable panoramic views of the highest mountain ranges of the Ukrainian Carpathians: Chornjgora, Svydovets, Gorgany and Maramorosh. 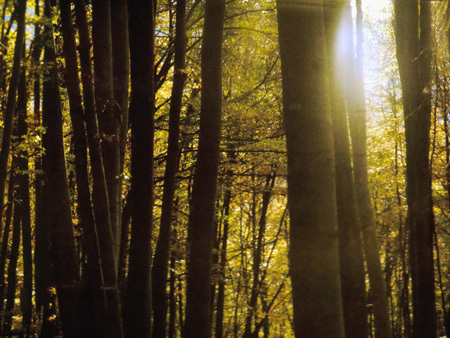 Is the world's largest array of beech forests, an area of over 10 thousand ha. At the same time it is the largest part of a UNESCO World Natural Heritage “Primeval Beech Forests of the Carpathians and the Ancient Beech Forests of Germany”. Virgin forests of Uholka affect its grandeur and antiquity of virginity. The trees here reach gigantic size and have age of more than five hundred years. One of the most famous Swiss researchers said: “For Christians, once in a lifetime it is definitely necessary to visit the Vatican, for Muslims - Mecca, but for naturalists – Uholka”. 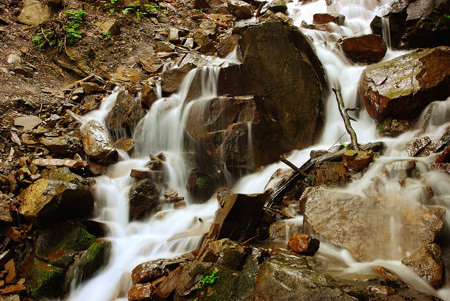 Is the highest natural waterfall of Transcarpathia of 36 m height, and also one of the most beautiful waterfalls of cascade type in the Ukrainian Carpathians. Located on the flow Trufanets - right tributary feeder of the river Black Tisa, which originates in the subalpine zone at an altitude of 1720 m above sea level at the foot of Blyznytsia mountain on the south-eastern slopes of Svydovets ridge. It was formed in place of wedging resistant to destruction sandstone. 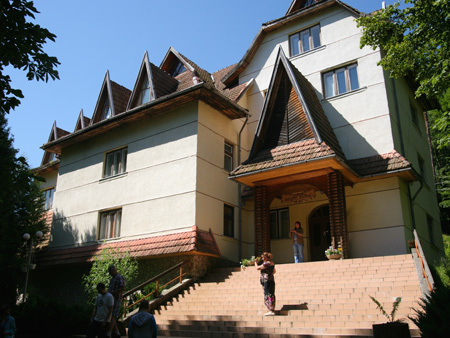 Museum of Mountain Ecology is one of the largest and most unique museums of Ukrainian Carpathians. Its exhibition is devoted to natural mountainous regions of the planet, as well as culture, customs and traditions of Ukrainian highlanders. The museum exhibition includes aqua terariumnyy complex where you can see the typical inhabitants of the Carpathians - fish, reptiles and amphibians. Strukivska church or Church of the Ascension (villageYassin) was built in 1824 without a single nail and is the perfect model of traditional Hutsul sacred building. Inside magnificent iconostasis is preserved. The bell tower built in 1813 is consisting an ensemble with the church and has its own artistic value. 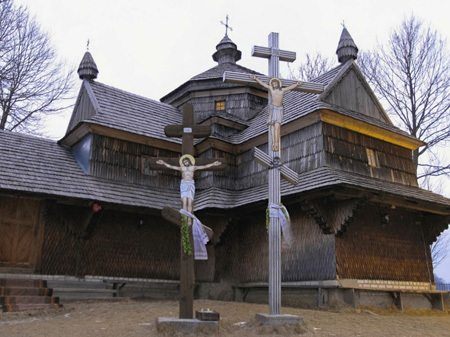 Strukivska church along with other wooden temples of Ukrainian Carpathians is nominated for inclusion in the list of UNESCO World Heritage Site. 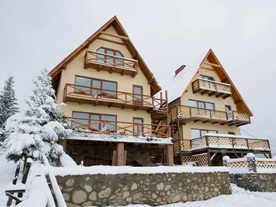 Private estate “Rakhiv is located at an altitude of 950 meters above sea level and 500 meters above the city center Rakhiv with a wonderful view on some of the highest peaks of the Carpathians – Goverla, Brebenskul, Pip Ivan, Black Mountain. 2 km from the house is a source of mineral water “Burkut”. 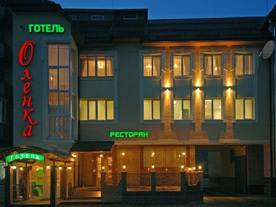 Hotel “Olenka” is located in the city around of beautiful sites, wonderful, unique beauty of spruce area of a mountain valley in the heart of the Carpathian mountains, where merge rivers White and Black Tisa and beauty Tisa originates. 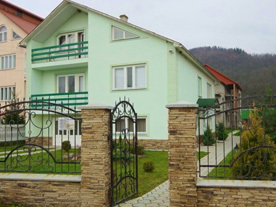 Private estate “At Eric” is located in the village Solochyn of Slaljava area where they are specializing in the treatment of diseases of the stomach, liver and biliary tract, kidneys and endocrine system. 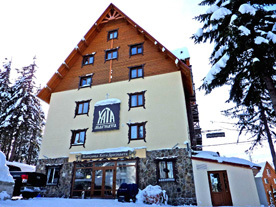 Mountain Resort is located at the Yablunytsya pass at an altitude of 1060 m above sea level, in the village Yablunytsya. It can be seen everywhere - a beautiful new building on a hillside near the forest. 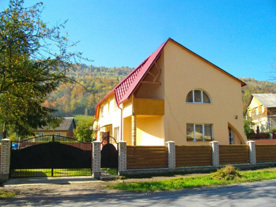 The manor "Kvasivska Trembita” is located in the center of the village Kvasy of Rakhiv district, which is known for its healing mineral water. One of the most secluded and comfortable hotels of Dragobrat valley that converts summer and winter holidays in this tale. Nowhere else in the former Soviet Union, except Transcarpathia there are as many unique sources of mineral waters. The chemical composition and therapeutic properties are not inferior, and often even the known waters of the Caucasus, Poland and France. Four centuries ago, in 1558, Russian ambassadors of Ivan the Terrible, returning through the end of Tsargrad to Moscow, reported the embassy Office: “... In the mountains of Polonyna there is a well, and it has sweet water as pear brew. And there are other wells, but the water is like vinegar, while others - like sour soup ... and in the mountains water flows from stone, and there are hot, you can cook an egg ... and in the waters many people come patients with various tumors, they are placed in water and all who comes are healing... “. And not a whim mineral water springs from the Carpathian is delivered to the table of Hungarian kings, monarchs of Austria-Hungary and France - the rulers of states appreciated the water for its amazing power. And in the middle of the nineteenth century “Polyana kvasova” taste and medicinal properties has been recognized as the best in Europe. According to historians, in Paris, New York, and later in Tokyo it was sold only as an expensive table drink in restaurants and in pharmacies there were lines for it! The territory of CBR is important to preserve the culture of Ukrainian highlanders - Hutsuls, Boykies and Lemkies. By this time, a common practice here is alpine dairy sheep with unique traditions that are currently unique in Europe nature and carving, manufacturing of carpets, and many other folk arts and crafts. Anyone can buy a variety of handmade items that are made in the traditional style and with ancient technologies. Regularly are held a number of folk festivals, which are pure breath of ancient times and are not adjusted to the times and popular culture. Mostly they are associated with some important events, such as summer seeing flocks to the mountain or on specific local products, such as holiday of Hutsul cheese, “Berlybaskyy banosh” or “Kvasy Blankets of wool”. Great attention is paid to the case of environmental education and awareness of the population. Environmental actions, events, continued involvement in the life of local communities provide a positive image of the reserve. The organization publishes the journal “Green Carpathians”, own newspaper “Herald CBR”. Systematically is expanding network of information centers. The most picturesque corners of the Reserve equipped 18 ecotourism trails, 36 km of Transcarpathian tourist path. Recreation and tourism infrastructure is improving every year by creating new permanent recreation areas, shelters and ecooffices. 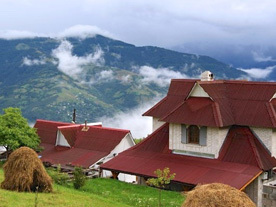 The most significant infrastructural facilities for ecotourists – is Tourist Information Center “Carpathian mountains” - created in 2011 at the foot of Hoverla. For the first time in high Chornogory travelers can get shelter for the night, various information, communication services. 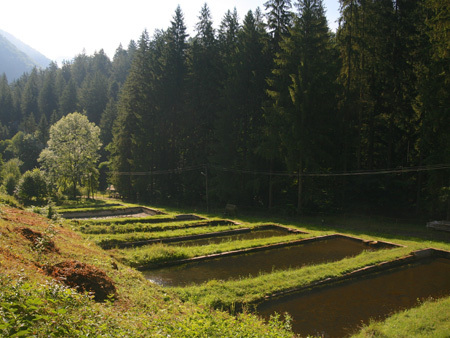 Active outreach activities is conducted by environmental and educational center “Centre of Europe” and the Museum of Ecology of Mountain and Environmental Sciences History in Ukrainian Carpathians with aqua terrarium complex collection of live and active mining model watercourse.